One of the best things about using rack mounted servers is that you can fit lots of them into one rack, thus saving a lot of space. This is possible largely because servers don’t require keyboards, monitors, and mice in most situation. Once the server is configured, it typically runs without any issues for months, or even years, at a time. Even when someone does need to directly access the server, you can often remote into it from a PC on the network to take care of any problems. There are times, however, when a server becomes unresponsive and requires a KVM (keyboard, video, mouse) to be plugged into the server to see what is going on. In the past, most data centers would have a ‘crash cart’ that had keyboards, monitors, and mice on them that could be rolled around, and then hooked up to the server in question. Today, however, the standard is quickly moving to having a KVM that attaches directly to the server rack itself. This offers many great benefits for those working in the data center, and is much safer for the equipment as well. Having a KVM attached directly to a server rack helps to ensure that it will be securely in place, and not at risk of getting bumped off like those on a normal cart. In addition, you can position the KVM at a height that is comfortable when sitting or standing, which will be appreciated when someone has to spend an extended amount of time working on a server to get it up and working properly again. These KVM devices also use a trackpad rather than a traditional mouse, which helps to avoid excess movement, and also minimizes the amount of space that is needed for the device itself. For larger data centers, companies often purchase one of these KVMs for each row of racks. The KVM can be quickly disconnected from the rack it is on, and moved to the rack where it is needed. This is a fast and affordable way to ensure the technical staff always have access to the servers directly, which greatly enhances their ability to troubleshoot issues and find the root cause. Smaller data centers, or server closets, may just install one KVM on each rack, which is another great option that can ensure immediate access to any server by moving the existing cables around. Built in Monitor – Having a monitor built right in to the KVM helps to ensure you are working with one set piece, rather than multiple components. Compatibility – The KVM should have connection options that will be compatible with all the major server brands including IBM, Cisco, HP, Lenovo, Dell (EMC), and others. Full Keyboard – Having a full keyboard will help ensure that all the required commands can be issued quickly and easily to any server that is having trouble. Trackpad Mouse – A trackpad allows for precise pointing and clicking on servers that allow that type of input. A traditional mouse is discouraged in this environment due to the limited space, and the risk of having extra cords moving around. 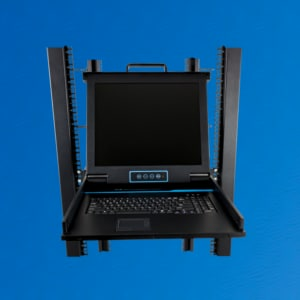 Secure Attachments – When attaching a KVM to a rack, it needs to be completely secured so it doesn’t bounce or move around. Taking advantage of the rack holes will help the KVM to essentially become one with the rack itself. If you have any questions about rack mounted KVMs, we are here to help. The team here at RackSolutions is excited about helping people with all their server rack related needs, so please don’t hesitate to reach out to us about this, or any of the devices we sell. 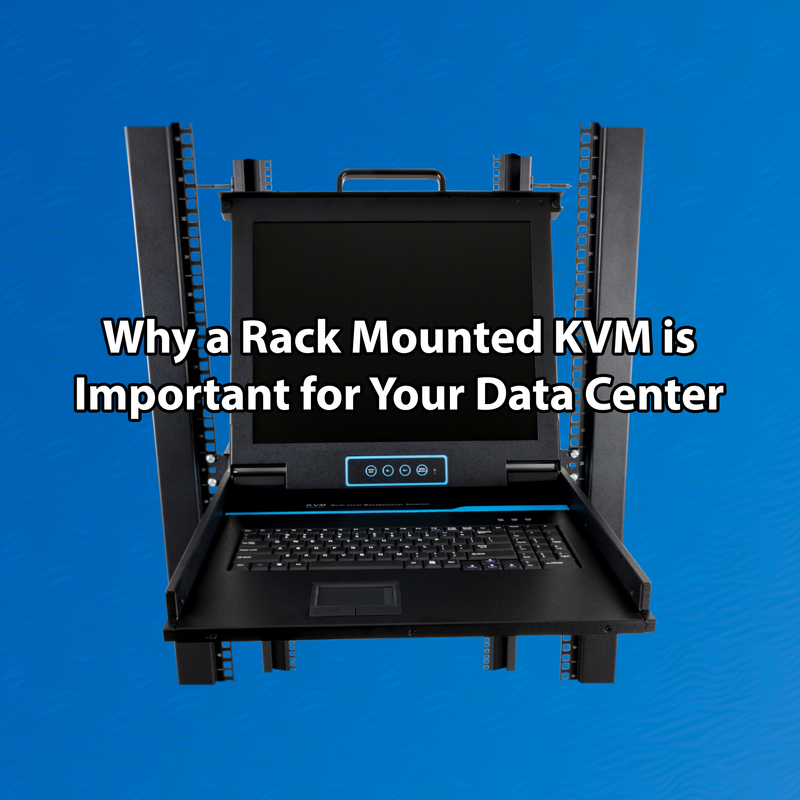 When purchasing a rack mounted KVM, you want to make sure that it has all the important features that are needed to enhance productivity in the data center.